Born on April 2,1939, this musicians contributions to music were ground breaking to say the least. The second eldest of six children brought up in a minister’s home, he began singing in church by the time he was just four years old. His childhood years were filled with turbulent times on the home front. But with a mother who encouraged him to pursue a singing career, Marvin Gaye, stepped into the spotlight with a controversial number one hit. Although he had a number one hit with “I heard it through the Grapevine”, he was reported to have said he felt as though he did not deserve it. At that time he felt like a puppet just singing other people’s lyrics. It was not until he heard a story from Renaldo “Obie” Benson of the Four Tops that he got his inspiration for the song “What’s Going On”.You see, Obie had witnessed police brutality at an anti war rally in Berkeley.After he recorded the song Barry Gordy initially refused it’s release, saying it was too controversial. 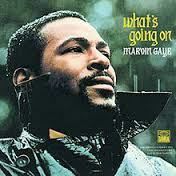 Marvin Gaye went on strike from recording until it was released on May 21,1971. The song went straight to the top of the R&B charts within a month,remaining there for five weeks.It also reached the top spot on Cashbox’s chart and reached number two on the Hot 100 chart. Marvin Gaye died when he was just forty four years old. But within his lifetime he told us many stories and brought to light things we may have never known about. Tell your story, whatever it is that concerns you about the world in which we all live. Aim for the top of the chart results, you just might be pleasantly surprised!